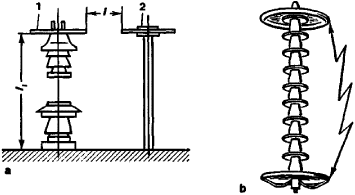 An arrangement of two electrodes between which a spark may occur; the insulation (usually air) between the electrodes is self-restoring after passage of the spark; used as a switching device, for example, to protect equipment against lightning or to switch a radar antenna from receiver to transmitter and vice versa. an air gap separating the electrodes of high-voltage equipment. A distinction is made between protective and separating spark gaps. A protective spark gap guards insulation from overvoltage and the effects of electric arcs. In such a gap (see Figure l,a) the metal electrodes (1) and (2) are connected in parallel with the insulation being protected. The insulator is not exposed to the effects of the arc, since the arc is established across the air gap l (which is smaller than l1). Protective spark gaps are classified according to the shape of their electrodes as rod gaps (Figure l,a) and ring gaps (Figure l,b). A separating spark gap is the main component of a valve arrester. This type of gap protects the operating resistor OR of the gap (Figure 2, a) from the effects of the rated voltage of the device. 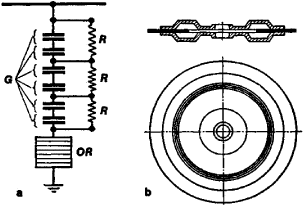 The resistors R are used to equalize voltage distribution over the spark gap G. The overvoltage wave is shunted to ground through the operating resistor, and the arc of the accompanying current of industrial frequency (50 hertz) is extinguished by being broken into short arcs across the individual spark gaps (see Figure 2, b). An isolating spark gap is made up of two, four, six, or more spark gap units. The air gap of a spark gap unit is usually about l mm; the number of units is based on one gap per kilovolt of rated voltage. The region between two electrodes in which a disruptive electrical spark may take place. The gap should be taken to mean the electrodes as well as the intervening space. Such devices may have many uses. The ignition system in a gasoline engine furnishes a very important example. Another important case is the use of a spark gap as a protective device in electrical equipment. Here, surges in potential may be made to break down such a gap so that expensive equipment will not be damaged.